So the fashion weeks are in full swing again - New York fashion week already came to an end, and London is just around the corner. 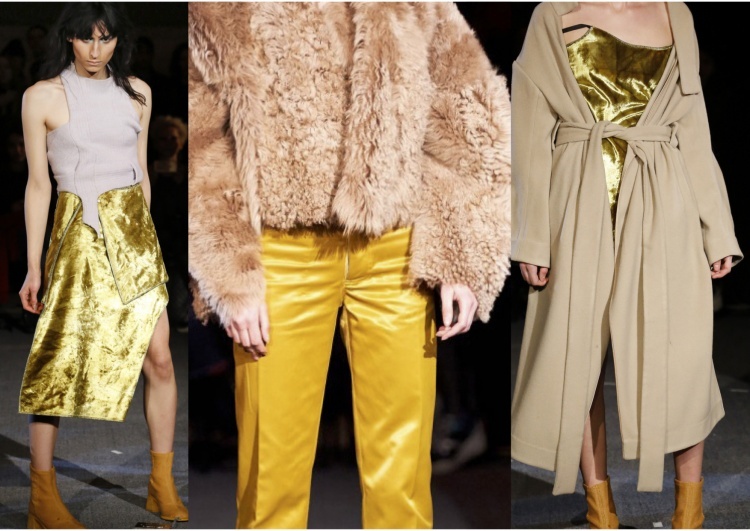 Here are some of my favorites from the NYFW shows! Especially the soft, earthy colors that came across these following collections were interesting to me. I’m loving the soft pink and tan, orangey colors mixed together. 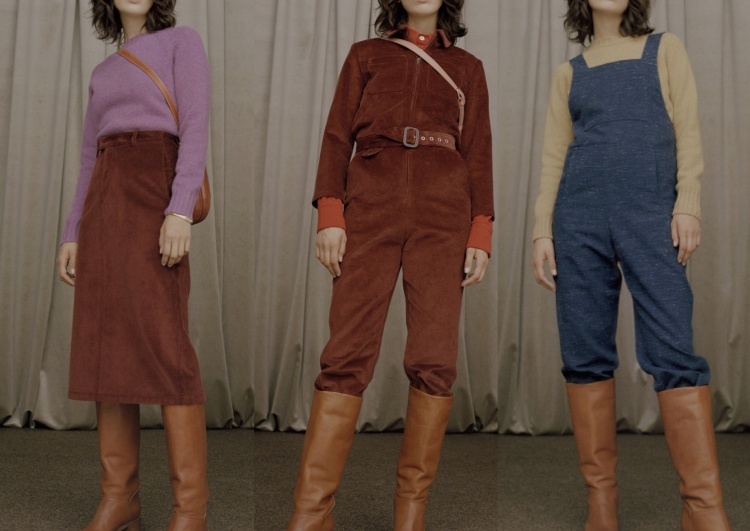 I think the role the fabric plays in these collections is very important and the contrast between these hard and soft fabrics; we see velvet, corduroy, suede, silk. The silky flowing fabrics paired with heavy materials make a tough but elegant look. 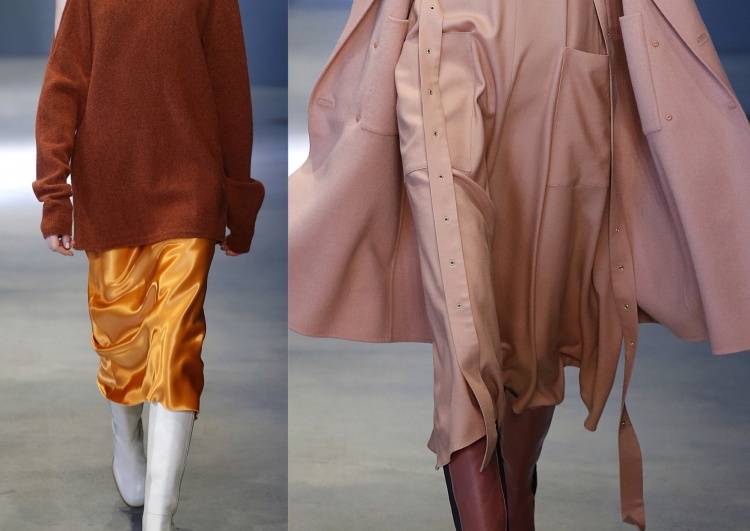 Eckhaus Latta is a New York based designer duo (Mike Eckhaus and Zoe Latta). They didn’t have a specific inspiration for this collection - they tend to build upon their previous collections and work on the stuff they find interesting; it’s more about the shapes and the fabrics. You can see that the designers have a background in sculpture and textile design; some of the garments were abstract in their construction, but by using the catchy fabrics in a modest way, they still make the garments pretty easy to wear. 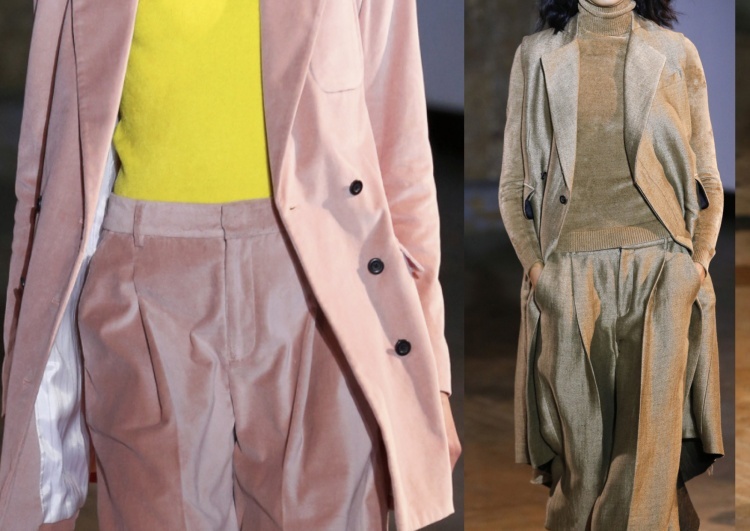 What’s also nice is that they used ‘real’ people to present their collection; men and women with different shapes and sizes - a good thing that is happening more and more in fashion at the moment, especially with the newer/younger brands. I think it’s easier for them to make these kind of changes because they don’t have a steady way of presenting they are accustomed to. 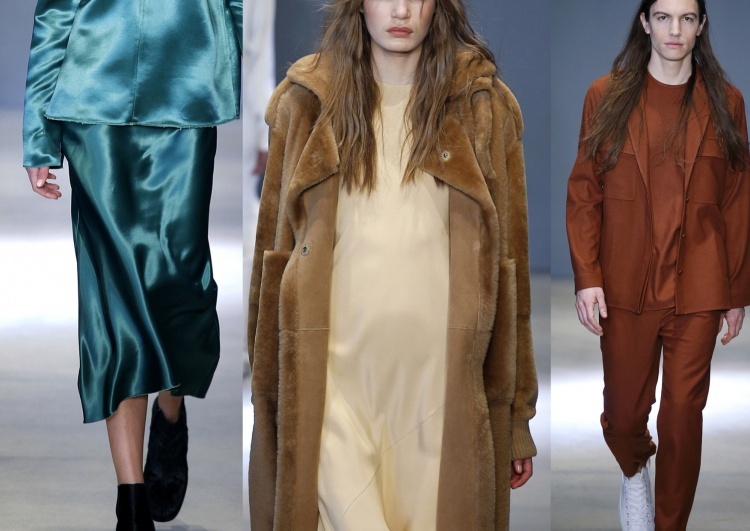 A.P.C usually shows in Paris but since they have teamed up with an American brand - Outdoor Voices - it was New York fashion week for them this year. Creative director Jean Touitou told the crowd at his presentation that they shouldn’t expect ‘something revolutionary’ - still there is a really nice new feeling to the whole look of the collection - with influences from the seventies, nice chunky boots and then the collaboration with Outdoor Voices; sporty pieces, yoga pants, jumpsuits etc. 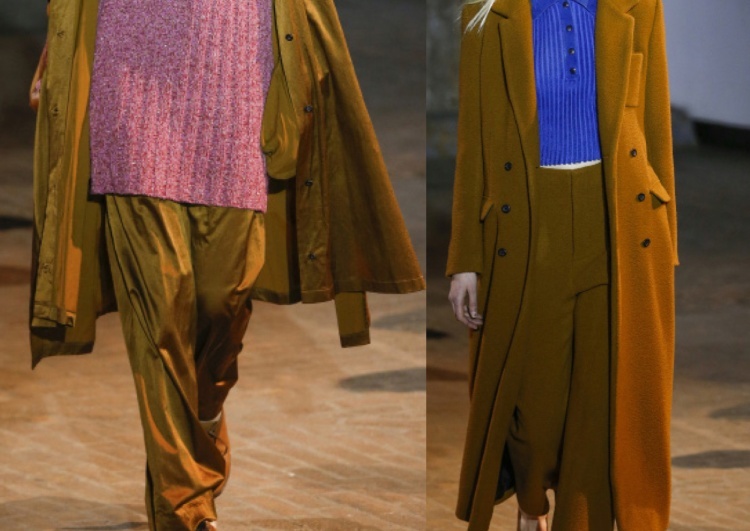 Proenza Schouler’s collection was inspired by the 1960’s and 70’s Process Art movement, with Frank Stella as an influence. Jack McCollough and Lazaro Hernandez explained that the collection is about control and release; saying that last season they were peeling away layers, which they are now putting back again. They did this using a lot of enlarged lacing on the outside of garments and straps crossing the body. The Tibi show also included a couple of male models for the first time, yet they don’t have a menswear line. The boys were wearing larger fits of the womenswear key items. 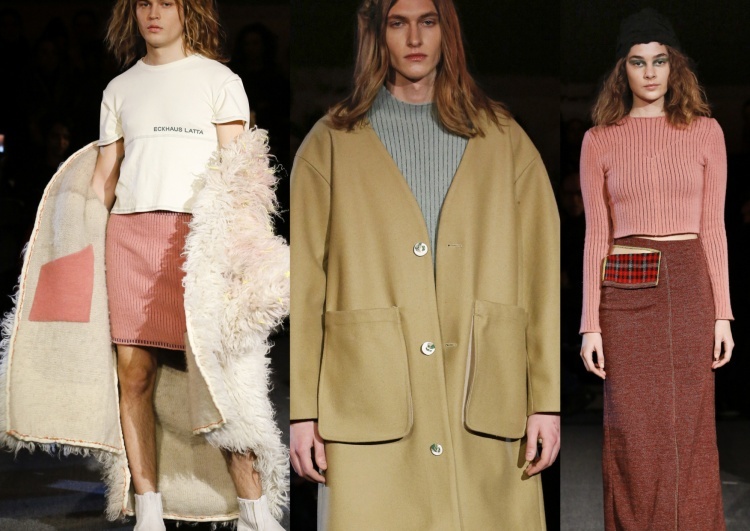 Designer Amy Smilovic wants to tell us it’s okay for men to wear women's clothes as well. Amy is all about comfort and she uses a lot of masculine influences to create easy, roomy silhouettes. The beautiful dark blue, pink, and greens were variated by glittery fabrics. 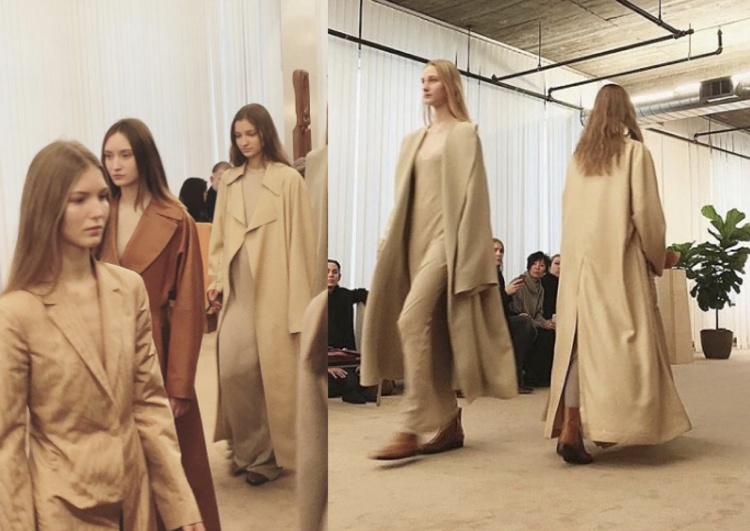 For me, The Row really has the most perfect minimalist clothing, perfection up into every little detail. Again we see a lot of neutral colors; and long silhouettes. They worked with the most expensive and luxurious fabrics and mostly just let these fabrics speak for themselves. Creatures of Comfort was founded by Jade Lai and started out with a shop in LA in 2005, and in 2010 she openend a shop on Mulberry Street in New York. The shops stand for a certain easygoing lifestyle, selling simple and honest products and, since 2010, their own clothing line. This fall collection was inspired by 17th century Dutch Romanticism, think long wide dresses, pompoms, ruches and more literial with the small hearts (all very discreet). I love the pink suit they opened the show with! Excited to see what’s next with London, Milan and Paris coming up!